Figure 1 (from left). Often the first signs of white mold (Sclerotinia Stem Rot) will be the appearance of pockets of dead and dying plants in the field. On individual plants look for white fungal growth on the stem. Slicing the stem usually will reveal small black sclerotia bodies. Over the past week we have seen a buildup of disease activity in soybeans. 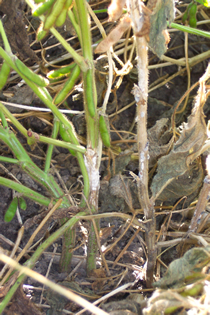 White mold or Sclerotinia Stem Rot (Figure 1) continues to be reported. This is a good example of a disease that needs to be treated well before the disease is visible. The actual infection occurs on the senescing flower which the infecting fungus uses as a food source. Typically, all infections in soybean start at a node. You can usually tell when the infection occurred based on how high up the plant the stem lesions and fungal growth occur. This year's cool wet conditions during flowering were favorable for infection, and cool temperatures over the last couple weeks were favorable for more fungus growth. Symptoms at this point in soybean development will be individual or small pockets of dead or dying plants. Upon close inspection you will see a white cottony fungal growth on the stems, which also may include dark black bodies (sclerotia) of the fungus on the stems. If it is drier and plants are dead, the stems will be very light (bleached) in color. 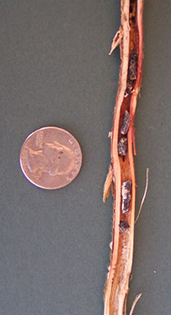 When dead stems are split, often you will see the small black sclerotia of the fungus inside. 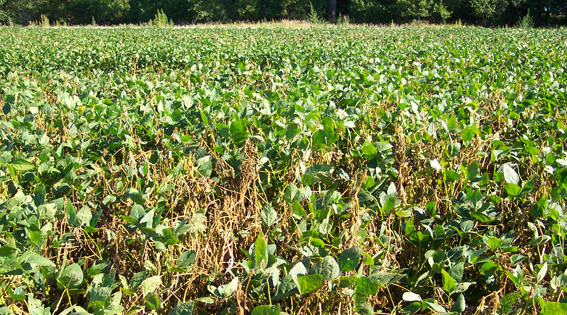 Learn how to differentiate all the stem and root rot diseases of soybean and much more at the Aug. 27 Crop Management Diagnostic Clinic near Mead. Among the speakers will be UNL Plant Pathologists Loren Giesler (soybean) and Tamra Jackson-Ziems (corn) on late season crop diseases. Frogeye leaf spot (Figure 2) can be found from southeast Nebraska to the northern border. While there are some pockets or fields with quite a bit of damage, it is most likely not profitable to treat fields once they are in the R5 growth stage. We do not have a good threshold for this treatment and treatment decisions should be based on the growth stage and weather forecast. Most research shows the best results with R3 to early R4 applications. If your fields are at an earlier growth stage, treatments also may be profitable, assuming the variety is susceptible. Cooler weather does not favor disease development. Keep in mind that foliar applications should also reduce any damage due to brown spot which is very common in most Nebraska soybean fields. This disease will not spread much if temperatures are in the 90s. The optimum temperature for growth of the fungus is 75°F. The most effective treatments for this disease are made during flowering. There is no indication that late season applications will improve yield. Throughout the season we have seen Phytophthora Root and Stem Rot (Figure 3). Symptoms associated with Phytophthora sojae infections include seed rots, pre- and post-emergence damping off of seedlings. and stem rot of plants at various growth stages. The stem rot phase is easily identified by the dark brown color on the exterior surface of the stem and lower branches. Discoloration of the stem extends from below the soil to 6 inches or more above the soil line. The taproot turns dark brown and the entire root system may be rotted. Leaves on older infected plants become chlorotic between the veins followed by general wilting and death. Leaves will remain attached. Figure 4. Foliar, stem and crown symptoms of sudden death syndrome are shown here. The cool and wet soil conditions at planting this year were favorable for early infection with Sudden Death Syndrome (SDS) (Figure 4). The first signs of SDS appear as scattered yellow or white spots on the leaves in the upper portion of the canopy. In the intermediate stage, these spots eventually coalesce to form brown streaks between the veins (interveinal necrosis). On these leaves only the midvein and major lateral veins remain green. As the disease reaches the more advanced stages, premature defoliation occurs with petioles (leaf stems) remaining on the plant. The progression from early symptom to defoliation will occur rapidly (less than 14 days in most cases). Symptoms of SDS can be confused with symptoms of brown stem rot. To differentiate the two, split the stems of infected plants and check for discoloration. If the pith (center stem) is discolored, this is a symptom of brown stem rot. Stem discoloration will be confined to the outer stem layers (vascular tissue) with SDS and can extend up the stem of infected plants. Leaves will typically defoliate in the later stages and the leaf stem (petiole) will remain attached. Brown Stem Rot (BSR) (Figure 5) can look a lot like SDS. Infected plants may not show visible symptoms other than premature death which may be confused with early maturity or dry weather. 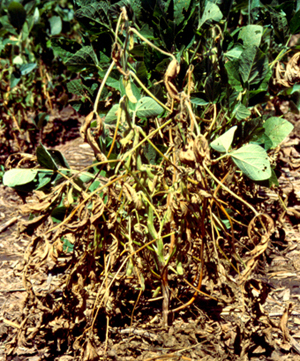 Brown stem rot can produce both foliar and/or stem symptoms. Split stems of infected plants reveal internal browning of the pith and vascular tissue. Pith discoloration starts at the base of the stem and moves upward to the nodes and progresses into the internodal tissues during the growing season. Later in the season, infected plants may wilt and show external browning on the lower part of the stem. Severely diseased plants may lodge. 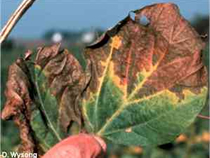 Leaf symptoms may resemble high temperature "scorch" or drought stress. Leaves on infected plants may develop interveinal chlorotic (yellowish) blotches. Tissue between the veins dies and turns brown, whereas tissue adjacent to veins remains green and is the last to die. This foliar symptom can be confused with sudden death syndrome. Eventually all leaves will curl and die and will remain attached to the leaf stem (petiole). Foliar symptoms will not develop if air temperatures are high (above 85oF) during the R3-R4 growth stages. Field distribution will typically be in patches or packets of plants. The best action at this time is to identify these and other problems correctly so that you can use resistance to manage them in the future. As with any disease, correct diagnosis is critical to management. If you are uncertain of the cause of damage in your field, I encourage you to have it identified at the UNL Plant and Pest Diagnostic Clinic. More information on these and other soybean diseases can be found in the Soybean Disease section of CropWatch.